Can Office365 users share calendar with people who don’t use Office365 or even Gmail users? You sure can, as long as your administrator sharing with external users turned on. 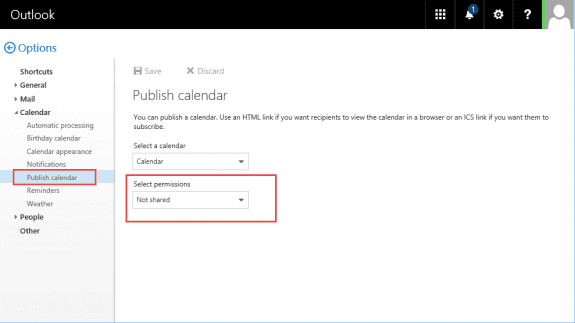 You can share the calendar from Outlook or OWA. The administrator controls (using the Sharing Policy) whether you can share availability only or additional details. 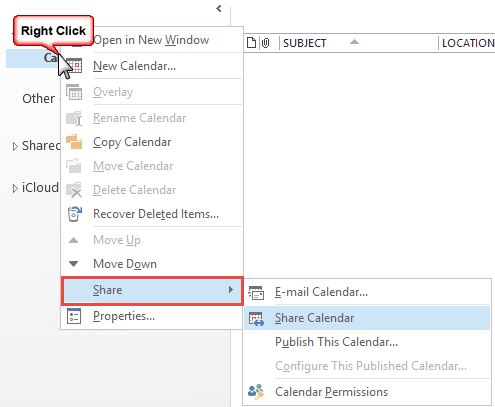 To share the calendar from Outlook, right click on the Calendar and choose Share. You’ll have one or two choices: Share Calendar and Publish This Calendar. Each calendar should have Share, while only the default Exchange account will have Publish This Calendar. You’ll be able to choose between Availability only, Limited Details, Full Details and Editor (if policy allows). If you have more than one Exchange account in your profile, only the calendars in the default account can be Published from Outlook. You’ll be able to Share the calendars in all Exchange accounts with co-workers and may be able to share them with people outside of your network. When you choose Share, a Sharing Invitation opens and you can choose how much you want to share with the person or group. If you send the invitation to someone not on your exchange server, they will be limited to the level of detail set by the Administrator in the Sharing Policy applied to your mailbox. When you choose Publish, the Outlook on the web Options page opens to the Publish Calendar page and you can set or change your publishing options. To share from Outlook on the web (OW), you'll need to log into OW then click the Gear icon and select Options, then expand Calendar on the left and choose Publish Calendar. Select the desired permissions and click Save to create an HTML and an ICS URL. When you share using the ics link, users can subscribe to it in any client or service that supports calendar subscriptions or give out the HTML link so users can open it in a browser. If you want to see what the HTML link looks like, this URL points to a calendar in one of my test accounts. Don't forget: anyone who has the ics or HTML link can view your calendar. Administrators can check or change the Sharing policy in the Exchange Admin Center, under Sharing. Administrators can allow users to publish the calendars to external users and limit calendar sharing to specific domains and specific amount of calendar information (free/busy or all details). On-premises Exchange users may be able to share their calendar with external users using the Share command. POP3 and IMAP users can publish their calendar only if they have a Web-DAV server to publish the calendar to.